Norwich High School’s Digital Media and Coding Club is giving students a chance to acquire 21st-century skills in a structured after-school setting. Launched in November of 2018, the DMACC allows Norwich students to engage with the ever-expanding digital world of computer programming. Participants power up their school Chromebooks at the start of each session and learn how to code using a combination of Codecademy and App Academy. Codecademy provides introductory lessons to a variety of computer-science topics and App Academy is a full-fledged Development Bootcamp used to train adults for coding jobs in Silicon Valley. These programs give our students exposure to the 21st-century skills necessary for high-paying jobs. The second part of DMACC sessions focuses on team building through eSports, which is a growing industry. Universities such as SUNY Canton offer athletic scholarships for eSports athletes, who may go on to compete as professionals. 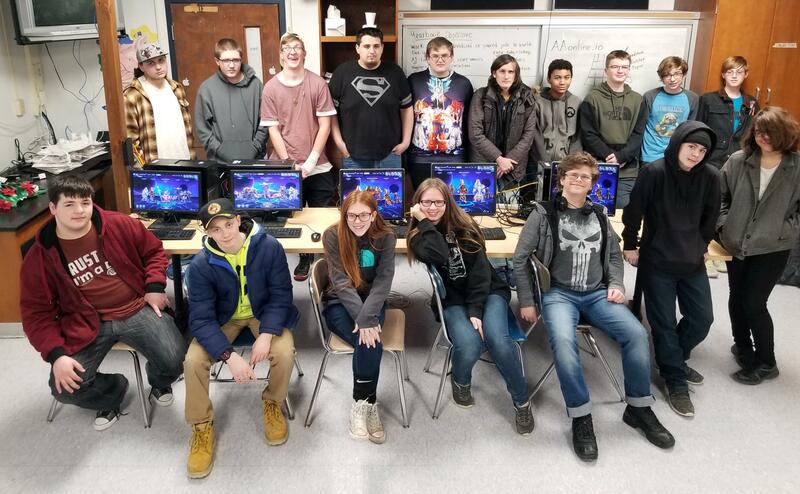 NHS is the first high school eSports team in the Southern Tier. Much like a track and field team, DMACC students specialize in different disciplines or games. Most games are team-based and require coordination and communication to execute strategies and obtain objectives. The club meets in the new NHS yearbook computer lab in the Art Department. DMACC officers are President Steven King, Vice President Cullen Sherrick, Secretary Michael Funaro and Treasurer Tyler Shimer. Mr. Beckman, Mr. Matthews, Mr. Schaffer and Mr. Genung serve as advisors.